A modern take on what's been putting big grins on the faces of Sportster® motorcycle riders for decades. Styling + Features 1200cc Evolution® Engine: 1200cc at your command to deliver tons of torque for an unforgettably fun ride. Blacked-Out Finishes: Blacked-out finishes from its powertrain to its air cleaner cover to its exhaust. Equipped to take on the urban grid. Throwback 70's Custom Tank Art: Authentic bold 70's-inspired tank graphic shows the bike's retro roots. Café Solo Seat: Sit "in" the bike while your hands and feet reach naturally to the controls. This seat pays homage to the heritage of the iconic Cafe Racer style. Black Mini-Ape Handlebars: Fists in the wind attitude with a conservative rise and bend for rider comfort. 9-Spoke Cast Aluminum Wheels: Nine-spoke wheels that are black as night from rim to rubber to complement the Dark Custom look. Fixed Speed Screen: The fixed black speed screen leaves no question as to the attitude of the motorcycle. Get behind it and hang on. 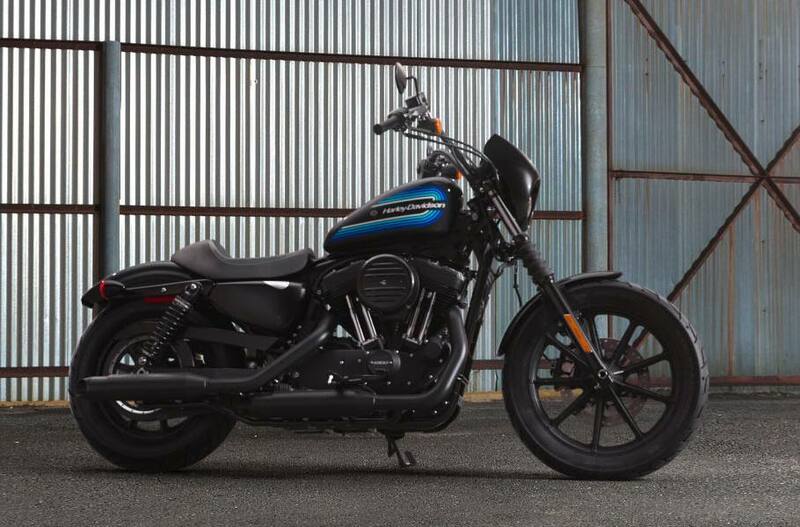 Engine Engine: Air-cooled, Evolution® Bore: 3.5 in. (88.9 mm) Stroke: 3.8 in. (96.8 mm) Displacement: 1,202 cc (73.4 cu in.) Compression Ratio: 10.0:1 Fuel System: Electronic Sequential Port Fuel Injection (ESPFI) Exhaust: Black, staggered exhaust and headers with black slash-cut mufflers Dimensions Length: 86 in. (2,200 mm) Seat Height, Laden: 25.7 in. Seat Height, Unladen: 28.9 in. (735 mm) Ground Clearance: 5.5 in. (110 mm) Rake (steering head) (deg): 30 Trail: 4.6 in. (117 mm) Wheelbase: 59.6 in. (1,515 mm) Tires, Front Specification: 100/90B19 57H Tires, Rear Specification: 150/80B16 77H Fuel Capacity: 3.3 gal. (12.5 L) Oil Capacity (w/filter): 2.8 qt. (2.6 L) Weight, As Shipped: 547 lb. (248 kg) Weight, In Running Order: 564 lb. (256 kg) Performance Engine Torque Testing Method: J1349 Engine Torque: 73 ft-lb (99 Nm) Engine Torque (rpm): 3500 Lean Angle, Right (deg. ): 27 Lean Angle, Left (deg. ): 28 Fuel Economy Testing Method: Estimated City/Hwy Fuel Economy: 48 mpg (4.9 l/100 km) Drivetrain Primary Drive: Chain, 38/57 ratio Gear Ratios (overall) 1st: 9.315 Gear Ratios (overall) 2nd: 6.653 Gear Ratios (overall) 3rd: 4.948 Gear Ratios (overall) 4th: 4.102 Gear Ratios (overall) 5th: 3.517 Chassis Wheels, Front Type: Black, 9-spoke Wheels, Rear Type: Black, 9-spoke Brakes, Caliper Type: Dual-piston front, Dual-piston rear Electric Lights (as per country regulation), Indicator Lamps: High beam, neutral, low oil pressure, turn signals, engine diagnostics, low fuel warning, low battery, security system (if equipped), ABS (if equipped) Gauges: Handlebar-mounted electronic speedometer with odometer, time-of-day clock, dual tripmeter, low fuel warning light, low oil pressure light, engine diagnostics readout, LED indicator lights NOTES: Vehicle may be shown with optional Genuine Motor Accessories. Recommended 91 octane or higher fuel (R+M)/2. Fuel Economy estimated from fuel economy tests on a sample motorcycle from the corresponding family conducted by Harley-Davidson under ideal laboratory conditions. Not all motorcycle models undergo fuel economy testing. Fuel economy and mileage may vary among motorcycle models within a family. Your mileage may vary depending on your personal riding habits, weather conditions, trip length, vehicle condition and vehicle configuration and other conditions. Break-in mileage may vary. Engine torque values shown are nominal. Performance may vary by country and region. Standard and optional fuel systems may vary by country. Standard and optional wheels may vary by country and region. North America security system includes immobilizer; outside North America the security system includes immobilizer and siren. Seat Height measurement reflects 180 lb. (81.7 kg) operator weight. A modern take on what's been putting big grins on the faces of Sportster® motorcycle riders for decades. 1200cc Evolution® Engine: 1200cc at your command to deliver tons of torque for an unforgettably fun ride. Throwback 70's Custom Tank Art: Authentic bold 70's-inspired tank graphic shows the bike's retro roots. Café Solo Seat: Sit "in" the bike while your hands and feet reach naturally to the controls. This seat pays homage to the heritage of the iconic Cafe Racer style. 9-Spoke Cast Aluminum Wheels: Nine-spoke wheels that are black as night from rim to rubber to complement the Dark Custom look. Fixed Speed Screen: The fixed black speed screen leaves no question as to the attitude of the motorcycle. Get behind it and hang on. Seat Height, Laden: 25.7 in.